Where has summer gone? Not only has it disappeared, but now September is almost over too. Oh well, I’m ready for fall anyway, which is a good thing since it’s officially here whether I’m ready or not. The garden bounty isn’t over yet though, and the last of September saw an eclectic mix of goodies coming in. Like these melons, for starters. I found two Ambrosias and one Brilliant canary melon last week. I do believe this is the last of the Ambrosias, but there is one more canary melon on the vine. The three in the about photo were all about three pounds each, small by summer standards but any melon is a welcome sight here this late in the year. Unfortunately the Ambrosia melons were pretty bland tasting, lacking the rich sweet flavor they usually have, probably due to cooler weather during the ripening period. Ambrosia is a long time favorite of mine, but this is my first time growing Brilliant. Last year we picked up a canary melon at a Nashville farmer’s market, on the advice of a vendor who assured us it was worth trying. He was right, it was quite tasty and of course that sent me scurrying to try and find seeds so I could grow it myself. Brilliant has a bright yellow skin and white flesh that is crisp and sweet. The flavor sort of reminds me of an Asian pear. It is lovely on its own or when mixed with other melons. I got the seeds from Johnny’s Selected Seeds. Also still coming in is another first timer here, the Kumi Kumi squash. We have really enjoyed it as a summer squash, grilled or lightly sauteed. In New Zealand it is commonly boiled, sometimes along with potatoes, though we haven’t tried that yet. And we also haven’t tried it as a winter squash. I would grow it again even if only to harvest it at the young and tender stage. Compared to most zucchini, young Kumi Kumi are firmer and less watery, and have an almost sweet taste to them. They are also a great size and shape for stuffing. And speaking of zucchini, Striata d’Italia hasn’t given up yet either. Every time I get another squash I think “this will be the last”, but so far it has proven me wrong. It will eventually quit though. The vine has wandered around quite a distance from the original planting spot. Right now it’s hanging out in the walkway at the end of the garden, so I get to step over it a lot. And while it was covered in powdery mildew about a month ago, the newer foliage is green and healthy without a sign of mildew. It has given us zukes for over 3 months now. The yellow squash Enterprise is still producing as well. We ate some of it yesterday. Ironically, one thing that is scarce these days are tomatoes. All in all it has been a pretty lousy year for slicing tomatoes, though we’ve had plenty of the small fruited types and the paste varieties. Our favorite Cherokee Purple did terrible, giving us a only handful of usable tomatoes. Fortunately, the heirloom beefsteak Vinson Watts stepped up to the plate (literally to the dinner plate). I got seeds last year from Lynn (Wood Ridge Homestead), and she called it her BFF tomato. We couldn’t agree more and now I think it is my new BFF too! We enjoyed some of them on sandwiches last week. Beefsteak types can sometimes be problematical to grow, but Vinson Watts is a keeper for sure. Just now coming on is the fall broccoli. I set out 16 plants, and hopefully that will give us plenty of broccoli to dine on before really cold weather sets in. The first head to be ready was Packman. We also got a small head from Purple Peacock, which is a lovely and tasty broccoli/kale cross. We steamed them both for lunch one day. I had forgotten how tasty broccoli can be when it is fresh and homegrown, but one bite and I remembered why I grow it! Frank Morton created Purple Peacock by crossing Green Goliath broccoli with two different kales. He calls it ‘brockali’, and I think that is a good name for it! It is a lovely plant, and the leaves can be used like kale while the purple and green florets are tender and tasty much like rapini. Kale itself is also on the menu these days whenever we want it. I harvested some Red Ursa the other night that we braised for dinner. I did a spotlight on this variety back in spring, and it is a dandy kale for sure. I also cut some of the Wild Garden Mix for some kale chips last night. This is a Frank Morton mix of various Brassica napus kales he got after crossing Red Russian and Siberian way back in 1984. The dozen plants I am growing this year are a lovely mix of colors and textures, and several of the plants have large smooth leaves that are perfect for kale chips. They have a sweet and mild flavor too, and I can’t wait to taste them after some frosts and freezes. It is my plan to save seed from my favorite plants of this kale and come up with my own mix. That will no doubt be a multi-year project. The peppers have slowed down ripening, but the plants are still flowering and setting green peppers. I’m drying many of the sweet peppers and making hot sauce with a lot of the hot ones. I’ll highlight some of the peppers and processing in a later post. I’ll be back soon with more happenings from HA! This entry was posted in Gardening and tagged Ambrosia, Brilliant, broccoli, kale, Kumi Kumi, melons, peppers, Purple Peacock, squash, winter squash, zucchini. Bookmark the permalink. Love the looks and description of the Purple Peacock, it sure is going on my list of must try next year. Norma, I think the Purple Peacock will be very useful in the kitchen. I am also curious to see if it survives our winter. Time will tell! 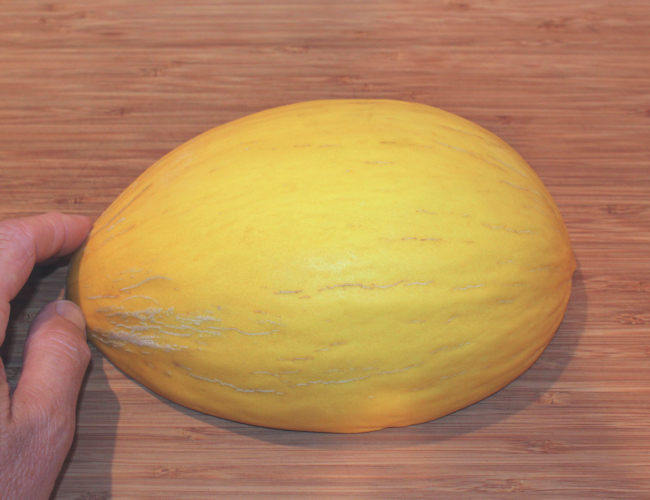 The kumi kumi squash is really very pretty mature. I love the mixture of orange and green. But what I envy is your broccoli. Last year my broccoli produced all summer and fall. This year they are being very finicky. I think next year I might have to plant some fall broccoli since I can’t count on mine to last. The spring planting of broccoli didn’t do too well here, so I was determined to have some for fall. So far, so good! Beautiful harvest! I can only wish for such lovely melons and broccoli. Oh, The Kumi Kumi sounds right up my alley… Only problem is I think my husband might disown me if I buy any more squash seed. I’ll have to be sneaky about that one! 😉 I am addicted to winter squash and try at least one new one each year- but he adores zucchini so maybe I can get away with this one! That’s the great thing about Kumi Kumi, it’s two (two, two) squashes in one! A great harvest week again Dave. We are missing broccoli right now for sure. We got ours in a little later that we should have and now I’m not sure it will make it before that really cold weather sets in. Sounds like your tomatoes have slowed down like ours. We only had about 7 pounds this week, just enough to keep us eating them fresh on sandwiches!! What a fabulous harvest for so late in the season! You are always growing some interesting varieties too, thanks for sharing the information with the rest of us! Lucky end of season melon harvest! Kumi Kumi squash is very intriguing. I love the idea of a squash that can be harvested young like a zucchini or age like a winter squash. Will you allow some to mature as winter squash? I would be very interested to know what you think of the flavor and texture of the squash. I have several that we will try as winter squash. I hope to get a first taste next week sometime, and I will report on the results here.